At the Kennedy Center Honors Obama had kind words about Mel Brooks. 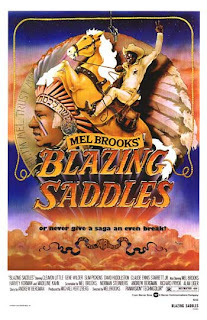 He said he saw "Blazing Saddles" when he was 10, and because of the ratings, he shouldn't have been allowed in--but he had a fake ID--and the statue of limitations had passed. I snuck in to see that movie as a kid also and parked my bike behind the theatre in the bushes. And somebody stole my bike. So I had to walk home and fess up. Lucky my Dad filed an insurance claim, and bought me a new bike. Eventually, the police found the stolen bike, and then I had two. But when we went to the movie, nobody asked us for IDs. Maybe the ushers now work for the Prez!